Skills are an intangible quality that cannot be precisely measured, but only judged. 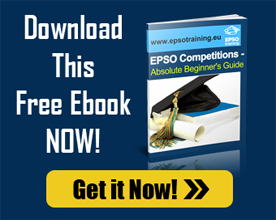 A professional’s true worth is based more on his grasp over relevant skills than on his grades and number of years of experience on EPSO tests preparation. Probably as a realization of this fine fact, the European Personnel Selection Office (EPSO) has shifted its selection criteria from knowledge to skills, this introducing the Epso Assesment Centre. These EPSO assessment centre tools will test your grasp over analysis, prioritization and organization, trouble shooting, communication, group working, resilience, learning and development, and delivering results. Administrators will be additionally tested for leadership qualities. The exercises will test the skills at least twice. Structured Interview is the ultimate test of various facets of your personality that you will have to pass during the Epso Assessment Centre. You can start by being prepared for some tough questions from seasoned interviewers. Greet everyone when you enter and maintain eye contact. Be natural while answering and take meaningful pauses. Here again, your body language comes into picture. Be confident without being overconfident. Use your hands and eyes to supplement your words. Try and answer in full sentences with the least number of words. Being yourself is the key at all these levels of assessment, for an original is always worth more than a copy. Be diplomatic but do not lie for the experienced interviewers will call the bluff. Apart from all this, you can follow the basic rules of appropriate dressing and grooming.